Will you survive the night? The world of Minecraft is a place of wonder, discovery and most of all: fun! But it can also be dangerous, even for the most battle-hardened players. 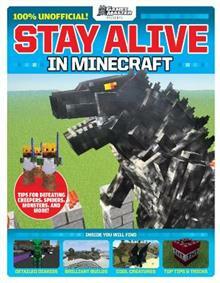 Stay Alive in Minecraft will keep you one step ahead of all the nasty mobs and creatures who might try to bring your adventure to a premature end. Filled with breakdowns of the best gear, combat tips, and advice from veteran players and streamers, this is the one book you'll need to survive in the crazy world of Minecraft. Includes full-color images and step-by-step instructions. 100% unofficial. Created by Future plc and GamesMaster, leaders in video game publishing.